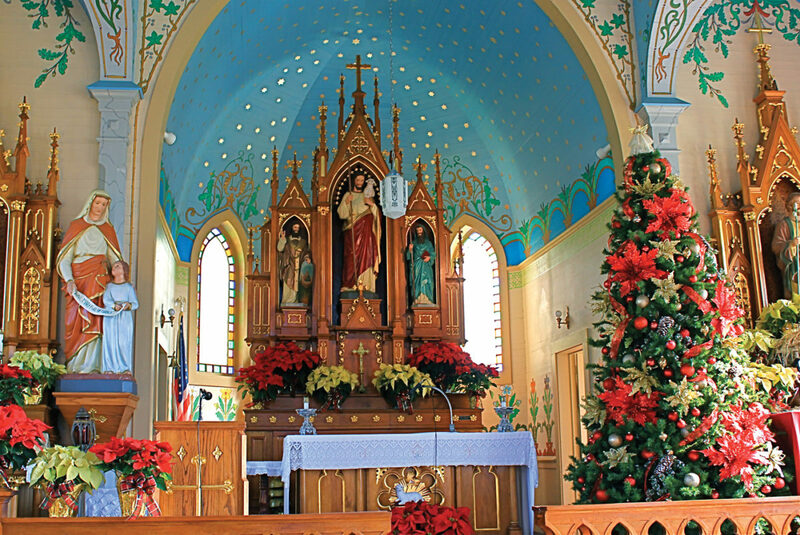 We were spending a part of our Christmas break exploring the painted churches around Schulenburg. The last on our list was the one I found to be the most amazing, Saint Mary’s in High Hill. Because my wife grew up in a world pretty much devoid of Catholics, I spent a good part of the day answering questions. She marveled at the difference between these little churches and the one she was raised in. While the outside architecture was similar, the insides were as different as night and day. While sitting there, we also talked about church music. I grew up on Bach and plainsong (chant), she on gospel accompanied by a piano. And then we discussed the changes in the church over time, a sad topic for me. I explained to her about the differences between the mass when I was a kid and what she would see were she to attend one today. Back then, the altar was turned around, with the priest facing the same way as the congregation. And the Latin! Even as a kid with no particular liking for religion, I thought the mass was beautiful. We sat for a long time—she taking in the beauty around her, and me thinking about the distance between my boyhood and today. We all started somewhere. For most of us, it was somewhere different from where we are today. For me, there is the obvious distance between Indiana and Texas for a start. But the far greater distance is from a working-class steel mill community to academia. As is the case with most of our lives, it has been a long journey—a journey of change. Many of my working class students are just now beginning to attempt a similar journey in their lives. They are starting with education but will quickly discover that is not enough. They must also work to change social class markers—speech patterns, critical thinking, etc. I always feel sad for them when they first start to feel that inevitable separation from friends and family as they make those changes. For a long time, the evolving student feels like a man without a home. He no longer fits in the old world he grew up in, but he has not yet found his place in the new one either. He feels rejected by the people in his life because they just don’t, or won’t, understand what he is trying to do. Meanwhile, family and friends in the old neighborhood feel left behind by someone who is getting “uppity” and thinks he is better than they are. It’s sad, but inevitable. And that never changes. Even now, decades later, I often feel insecure in this new world. I wonder, did I really change as much as it appears, or am I still that same working-class kid who’s now playing dress-up to impress the grown-ups. I often feel like I’m just bluffing my way through this new world, constantly worried that someone might catch on. What if they find out I really am just an imposter? I suspect I’m not alone in that feeling. You may not have made a class border crossing, but there are lots of other changes we go though in our lives that carry the same burdens. Some of us change cultures, moving to other regions of the country or even to other nations. Others go on a different career path than the rest of the family and friends and are stigmatized as a result. And frankly, some of us are the black sheep of our families for one reason or another. Whatever our circumstances, change is inevitable. Life is change. And with this barrage of changes, sooner or later, we become overwhelmed and start to question everything. Am I still the person I started out as all those years ago? Or am I really the person I seem to be today? Perhaps I am neither of those people but rather someone else entirely different? And probably the hardest question of all—is it all worth the cost? That’s a tough one to answer. But it doesn’t really matter; we can’t unmake the decisions from the past. The old adage is right; we really can’t go home again. The places we knew back then have changed, the people are different and some of them are gone, so why even try? And yet, we can’t just forget about who we were back then either. It is important to never lose sight of that, if for no other reason than to be able to fully appreciate how far we’ve come over the years. But it seems to me that remembering where we came from and being aware of where we are today doesn’t leave us that much closer to understanding who we are. It’s not enough to just appreciate how far we’ve come. Who we are is really a more complicated issue. To really understand our true identities, we need to see the bigger picture—where we came from, where we are today, and most important, every step that occurred along the way. It is the entire journey that identifies who we are. Aristotle argued that you can’t measure happiness in the moment. It must be evaluated over an entire lifetime. Identity has that same essence. It is the sum total of every instant of our existence. To look at it any other way would be doing ourselves a disservice. More important, it keeps us from ever understanding who we really are. And that understanding is a key to happiness and satisfaction in our lives. We are all the changes we have made or experienced throughout our lives. We’ve all come a long, long way. When looked at that way, I can’t help but be excited about who I am…and about who you are. Thanks for reminding us readers that we are a product of our past. Oh my, what a journey some of us travel to get where we are today! As always, Michael, a very good read! Made me stop and think! Thank you! As always, Michael has a wonderful and thoughtful perspective. Until I got to the end, I was afraid he was going to express disappointment in the development and change in his life. I say that his newer life is better. His story about the changes in the Roman Catholic Church reminded of a 1970s joke. After seeing the changes in the church, one older woman member remarked that she was going to have to die a Protestant whether she wanted to or not!! Great read! Especially the insight about how question our identities as we evolve. I am always amazed at your introspective at such a young age. It always makes one take time to reflect.